View of Broomielaw Bridge, sometimes known as Jamaica Street Bridge across the River Clyde in Glasgow, Scotland. The bridge was the first to be built across the Clyde and originally known as Broomielaw Bridge was completed in 1772. The architect was William Mylne and it was built by John Smeaton, the bridge was 500 feet long, 32 feet wide and had 7 arches. The bridge has circular holes above the arches and these were for flood waters to pass through so that the structure of the bridge would not be damaged. The bridge was narrow and arched and this meant that it was unable to cope with the increasing volume of vehicles that started to use it. 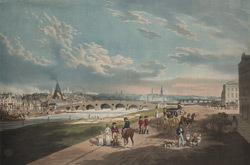 The bridge was replaced in 1833 with one designed by Thomas Telford. The bridge that stands in this location today is known as Glasgow Bridge. The disctinctive cone shaped Chimney of the Jamaics Street Bottle Works can be seen to the left of this print.